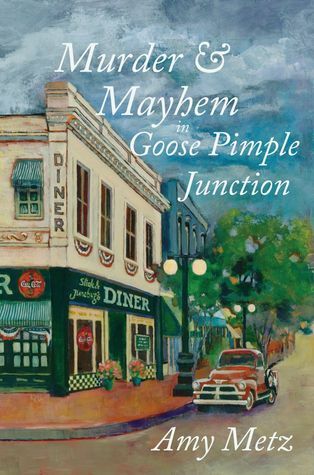 Murder & Mayhem In Goose Pimple Junction is a humorous southern mystery set in a unique town full of quirky residents. Grab a glass of sweet tea and settle in. You'll be laughing and guessing until the very end of this thoroughly entertaining novel. When Tess Tremaine starts a new life in the colorful town of Goose Pimple Junction, she thinks she's moved to a quiet little burg. Curiosity leads her to look into a seventy-five-year-old murder, and suddenly she's learning the foreign language of southern speak, resisting her attraction to local celebrity Jackson Wright, and dealing with more mayhem than she can handle. My Review: This wonderful book by Amy Metz features more than murder and mayhem. Don't let the title fool you. It's got romance, humor, and a whole cast of characters you'll love. I walked away from this book feeling like these characters were family. I can't help but wonder what happens to them next. The story is centered around an old mystery, so the tale moves back and forth in time as the author peels back layers of the 1930s mystery as well as the mystery unfolding in 'real time.' The pacing is quick, but not break-neck speed, which is a good thing because it allows for romance to gently blossom between two of the characters. As you work your way through the book, there are several times you might think you've solved the mystery, but trust me - there are some real surprises in this story. I would highly recommend this book to readers who love a classic whodunit, readers who like a little romance, or readers who just like a plain old good story. Warning: You might not want to read this book if you're out in public because there's a good chance you'll laugh out loud or smile like a lunatic while you're reading it.